Senate Democrats voted to give Joe Lieberman a slap on the wrist for his support of John McCain, and let him come off as the victor at the press conference at which the decision was announced. 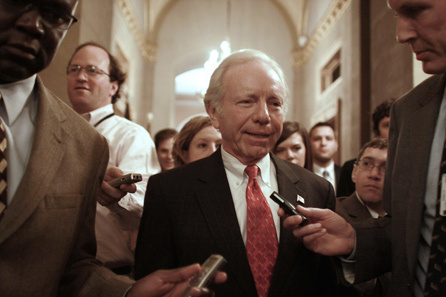 Sen. Joseph Lieberman, I-Conn., is questioned by reporters as he walks to the Old Senate Chamber on Capitol Hill in Washington on Nov. 18, 2008. Watching Senate Democrats' press conference about Joe Lieberman on Tuesday was something of a surreal experience: If you didn't know better, you might even come away thinking Lieberman still had leverage. As expected, Lieberman will get to keep his chairmanship of the Senate Homeland Security committee, and will have a subcommittee chair stripped from him. Still, it was surprising to see him actually take the podium at the press conference -- indeed, it seemed that Democrats had not planned in advance to let him use their forum to talk to the press. And when he did speak, Lieberman came off as the clear winner, and did no favors for the party that had just let him off with a slap on the wrist. It's a resolution that not only resolves the current dilemma, but it's a resolution of reconciliation and not retribution, and I appreciate it ... This is all about going forward. The problems our country faces now at home, particularly, and abroad are immense, and we will only deal with them constructively on behalf of the people who were good enough to send us to Washington if we display the kind of unity that was displayed within our caucus today. And hopefully it will go from our caucus across the aisle to our Republican colleagues as well. That in and of itself wasn't so bad, even though normally a political party in this situation would at least make Lieberman face some humiliation instead of allowing him to come off as the victor. But he went even further in his discussions with reporters after the formal press conference had ended. Referring to the resolution about him that his colleagues had approved, Lieberman said, "The resolution expresses strong disapproval and rejection of statements that I made about Senator Obama during the campaign. And in that regard, I said very clearly, some of the statements -- some of the things that people have said I said about Senator Obama are simply not true. "There are other statements that I made that I wish I had made more clearly. And there are some that I made that I wish I had not made at all. And, obviously, in the heat of campaigns, that happens to all of us, but I regret that. And now it's time to move on." Asked later, "Do you feel as though that you have been chastened in any way?" Lieberman responded, "Well, I think this was done in a -- in a spirit of reconciliation. And I think my colleagues voted overwhelmingly to go forward in a positive way, which was exactly the way that I intend to go forward. So I -- look, I appreciate their respect for my independence of mind. And that's who I am."